Cagayan de Oro Philippines has recently seen an increase in paddlers exploring the surrounding rivers. In the past people may have thought the country lacks exciting white water runs, not because the rivers are remote or inaccessible, but many people believed that a country with few rivers large enough to appear on a map must have low white-water potential. But in reality, the geography creates excellent runs. Many mountains lie close to the ocean, so water courses and plunges straight to the sea. In the interior of Mindanao and Luzon, some rivers build up enough volume, especially in the wet season, to offer rafting. If you are looking for some action, the Bubunawan River, in Cagayan de Oro Philippines comes roaring out of the forested north slope of Mt. Kitanlad, cutting a deep canyon through the limestone of the Bukidnon slope plain and merging with the Cagayan River just four kilometers from Cagayan de Oro Philippines. This makes Bubunawan the most accessible white-water river in the country, as well as one of the most challenging. The river is also very consistent, rainfall in Mindanao is more evenly distributed than in any other part of the country, making the top level susceptible to seasoned variations in water level. 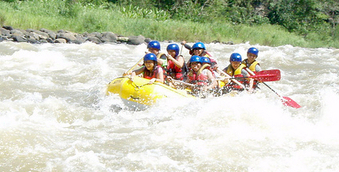 Over 50 kilometers of the Bubunawan River are accessible to river runners. The grade five upper half of the river is separated from the grade four level section by a larger waterfall, which requires a portage. Access to the upper half, the more difficult section is by jeepney to barangay San Vicente, where you will have to hire a carabao cart to take your gear to the put-in. The upper Bubunawan is a least narrow river and much of it runs in a narrow canyon. The riverbed is littered with huge rocks. Here, there are many rock obstacles to be negotiated (fortunately, however, most of the rocks are smooth) and the river most often challenge direction at abrupt angles of up to 90 degrees. The waves are large and often irregular. The rapids are continuous and opportunities for any easy stop may not always be available. Because of this, and because of the waterfall, this river is best run with a guide who is familiar with the water. Rupert Domingo is one of the active operators of white-water rafting in Cagayan de Oro Philippines. “Now, people are starting to enjoy the thrill and excitement of doing white-water rafting. One only needs a little stamina for this,” Domingo said. In white-water rafting one has two choices – the Western style and Pinoy style. For western, duration is four hours (basic in Mambuaya) and seven hours (advanced in Uquiaban). Tour rates-minimum of four persons, P1,609 with lunch; P5,579 with hotel. For Pinoy style, duration is 4 hours; minimum of 10 persons, P1,265 per person with the inclusion of roundtrip transfer, use of tubes and other safety equipment, and services of a river guide. The Cagayan also runs out of Bukidnon plain, at a somewhat less radical pace than the Bubunawan. Access is by jeepney to Cagayan de Oro Philippines to Talakag or Burungan, Bukidnon. The run is about 20 kilometers from the farthest entry point and can be completed in one long day or two short days. The greater part of the run is of grade 1-2, with a few sections at grade 3, possibly up to grade 4, in periods of high flow. Explorers have targeted the Mambuaya River and Uquiaban, upper Polangui River in Bukidnon, the Tagaloan River in Bukidnon and Misamis Oriental and the Mandulog River in Bukidnon and Lanao del Norte. It seems certain that at least some still unexplored rivers will offer high-quality paddling actions. Cagayan de Oro Philippines is located along Macajalar Bay on the Central coast of Northern Mindanao. Cagayan de Oro dubbed the “City of Friendship” has much more to offer to tourists besides the white-water rafting. The attractions include the underground Macahambus Cave and the 130-foot circular grove; three beautiful parks, namely, the Gaston Friendship, Vicente de Lara, and the Golden Friendship; the Xavier University Folk Museum which displays an array of relics of the Bukidnon and Maranao cultures; the Seminary Hill where one can find the San Jose Seminary, St. John Seminary and the Carmelite Convent; the La Castilla Museum which is the depository of household heirlooms and antiques at the Liceo University complex. Malasag Gardens, which stands on a 5.7-hectare site, features the different dwellings and the rich heritage of ethnic groups like Higaonon, Subanon, Talaandig and Matigsalog. The garden was inspired by the picturesque Gardens of Granada in Spain and the Boucchart Gardens of Canada. Getting to Cagayan de Oro Philippines, involves three choices --- by plane, from Manila, Philippine Airlines (PAL) have three flights daily; Air Philippines, one flight daily; Cebu Pacific, four flights daily. From Cebu, Asian Spirit has one flight daily. The second one is by land, Philtranco (Manila-Surigao); Rural Transit (Surigao-Cagayan de Oro); bus or van (all points in Mindanao) and the third one is by water, WG&A (Manila, Bacolod, Cebu, Jagna, Tagbilaran, Dumaguete and Iloilo); Negros Navigation (Manila, Bacolod and Iloilo); Sulpicio Lines (Manila and Cebu).